Send online this Magnificent Classic Moments Gift Arrangement to your special one and express your love. This Gift Arrangement is decked with Imported Silk/Art. 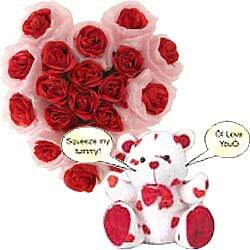 Heart Shaped Arrangement of 19 Red Roses and a I Love You Singing Teddy Bear. You can wash the Flowers.